The Cloud-based RAID Infrastructure (CRI) is used for data management in the CREMA platform. It provides access for the CREMA components to different types of data storage systems. The CRI supports different types of databases, such as structured data, semantic and binary data. These databases can be added to the accessed storage mechanisms as required using the Management Web UI accessible via the Dashboard component. The CREMA On-Demand Service Leasing and Releasing (OSL) component is used to instantiate services on demand on cloud resources. These services can then be used by the PRU to realized process executions. The OSL is furthermore in charge of monitoring the availability of all services and reports the actual usage to the MPM component for billing purposes. The CREMA Cyber-Physical Systems, Sensor Abstraction and Virtualisation (CVA) component provides a unified access to manufacturing-related sensor data sources and CPS, enabled through different technologies, e.g., smart objects, sensor modes, and wireless sensor networks. The CREMA Dashboard and Visualisation (DBV) will be the only GUI interaction platform for most of the users besides the CREMA MPM component. All components, which are aiming to interact with users, will be integrated into the DBV via provided UI components and related controllers. This includes manufacturing process information, alerts, runtime issues and many more. The main aim of the CREMA Data Harmonisation Services (DHS) is to assist in transforming and, thus, integrating data from concrete existing data sources using existing tools or enhancing/improving those following the data model specified in CREMA DLP component. 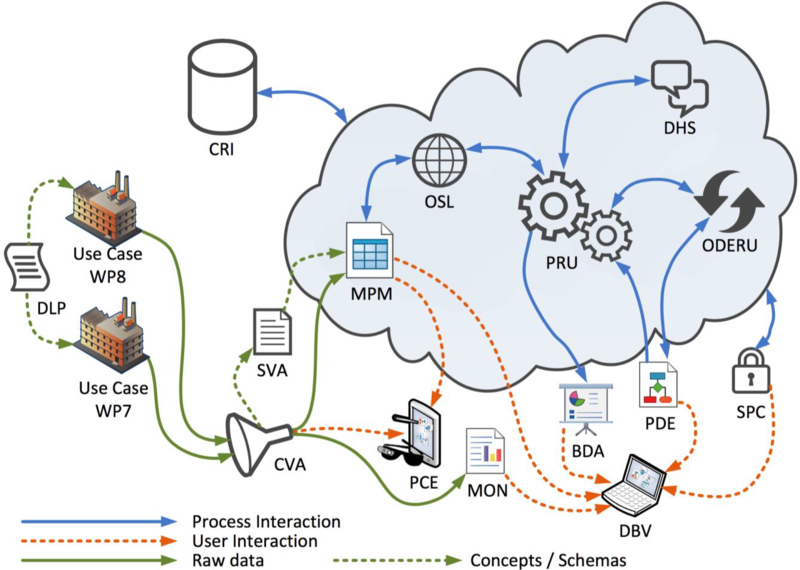 The CREMA Data Model, Model Library and Profiles (DLP) component supports the collection, basic management and querying of manufacturing related semantic models in terms of relevant domain ontologies and linked data sets. This semantic model library focuses on ontologies and linked data, which are related to the CREMA use case scenarios. The CREMA Monitoring and Alerting (MON) component is intended to provide means to monitor running process instances by monitoring data sources (i.e., process data from PRU and aggregated structured and semi-structured assets data such as machine data, tagged product data, location data, etc. from CRI) and predefined KPIs in order to handle snapshot and alerting operations together. The CREMA MPM component manages CREMA related services. It enables other CREMA components to add, update and delete services with default service endpoint addresses, semantic descriptions, conditions, costs, etc. Furthermore, the MPM enables scheduling services for later use in future processes. One key feature is to manage leasing and releasing actions for services interacting with the CREMA OSL component and thereafter the payment process. The CREMA Process Optimisation (ODERU) component supports the optimisation of service–based process models at their design time and runtime. At design time of process models in BPMN, ODERU can assist the process designer (PDE) in finding their optimal implementation with services. ODERU employs means of semantic service selection and composition planning as well as constrained optimisation problem solving for this purpose. The semantic annotation of services and process models is supposed to be in the W3C standard OWL. Results of optimisation are shared with other components in the cloud (CRI). At runtime and on request by the process runtime environment (PRU), ODERU returns a re-optimised process service plan with leasable services (OSL) and configuration for continued execution. The CREMA Service Virtualisation and Abstraction (SVA) component will provide design time functionalities to virtualise real-world manufacturing assets and services into services within the CREMA platform. This component allows virtualising services, i.e. describing these real-world manufacturing assets and services, i.e. services that come from the CPS, sensors from the CVA component, internal services running in the CREMA platform, and external services not running within the CREMA platform, performing their semantic annotation, and adding a Proxy Service Wrapper and binaries for internal services to them. The CREMA Manufacturing Big Data, Knowledge and Analytics (BDA) will provide business analytic functionalities to derive meaningful information and events from process and sensor data within the manufacturing domain. The CREMA Agile Personal Collaboration Environment (PCE) supports workers in fields of applications without or at least with minor knowledge. To accomplish this, a tablet application is used that enable non-local supervisors to instruct the Smart Glass wearing worker (addressee). The Smart Glass provides a user interface, which provides collaboration work opportunities to solve issues. Additionally, the collaborating partners use an audio stream to talk to each other. The CREMA Cloud Collaborative Process Design Time Environment (PDE) is a web based BPMN process designer. It will allow the ability to create production processes based on available manufacturing assets from the Marketplace Service Repository. It will allow the user to select and drag various assets and place them on a canvas where they can then connect these various assets together to create a process. The key features of the process design time is that it will have the ability to allow the user to model a process, optimise a process by using the CREMA ODE component and offer the user the ability to execute the process by using the CREMA PRU. The CREMA Cloud Process and Messaging Runtime Environment (PRU) component is responsible for executing processes, defined by process service plans. Each process service plan is created by the ODERU from a process model defined in the PDE. After a new execution request is received by the PRU, the PRU assigns a Process Engine that is responsible for the execution of this request. The corresponding Process Engine then executes the process by executing the assigned services in the order defined by the process model. If the execution fails, the PRU requests an optimization of the process via the ODERU. After the process is optimized the execution continues at the failed process step. The Security and Privacy Component (SPC) is an authentication broker and authorization framework focussed on user management, authentication and simplicity. Users and groups can be managed, public user details can be defined and external software can store settings and data it needs to resolve authorization decisions for users. While being the simplest imaginable security mechanism to implement software against, the SPC builds on the latest security patterns and also supports external authentication mechanisms and two-factor-authentication. For CREMA, the SPC's authorization framework provides the basis for the Cloud-RAID Infrastructure (CRI) to enable cross-organizational privacy-aware data sharing.